Silly Scientists Take a Peeky at The Solar System is FUN! This book (and soon to follow, music and app) will get kids learning and loving science with wildly-catchy rhymes about the origins of our solar system and all those bizarre planets whizzing around us. Planet Mercury is the fastest, watch it zoom around the sun. With frigid nights and days hot-HOT, it scorches little buns! Kids will zoom into space with their soon-to-be favorite monsters checking out Jupiter’s “zit” (the planet’s famous red spot), then take a dizzying ride on the sideways spinning Uranus. In this first Silly Scientists Series, kids will be introduced to the crazy monsters: Sulu, the surfer dude, and feisty, Tia, who speaks in Spanish, and the fuzzy green, Alan, who is always worried about something. 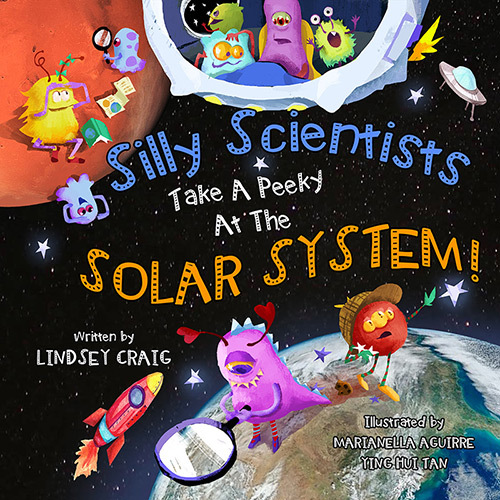 Silly Scientists Take a Peeky at The Solar System makes science fun for everyone! Silly Scientists Take a Peeky at The Solar System! This book is the first in the Silly Scientists Series.